Yu-Gi-Oh! 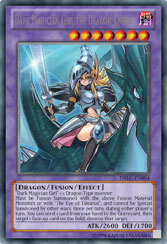 TCG Strategy Articles » Dark Magician Girl the Dragon Knight, Here at Last! Home > Special, What's New? > Dark Magician Girl the Dragon Knight, Here at Last! Dark Magician Girl the Dragon Knight, Here at Last! You’ve seen her on TV, you’ve seen her in all the promotional materials, and when Dragons of Legend launches on April 25th, you’ll finally be able to add Dark Magician Girl the Dragon Knight to your Extra Deck! Dark Magician Girl the Dragon Knight possesses the incredible ability to destroy any face-up card on the field during either player’s turn, just by sending 1 card from your hand to the Graveyard. On TV, Dark Magician Girl the Dragon Knight was the Pharaoh’s staunch ally in every Duel he successfully activated The Eye of Timaeus in, and now she can be your ally too! As a Quick Effect with no specific activation trigger, you can use it during any Phase of either player’s turn. It’s especially deadly during your opponent’s turn, as you can use it to cut down monsters like Brotherhood of the Fire Fist – Bear as soon as they’re played, or even destroy cards like Fire Formation – Tenki before they can resolve successfully. Knock off Bujin Yamato before he can make it to the End Phase, or destroy him over and over again during every turn, outlasting your opponent’s protective measures. Drop Noble Knight Medraut before he can draw his sword, or blast away a crucial Geargia monster before it has a chance to do any harm. There’s absolutely no doubt that her effect is extremely useful. The real question is, what’s the best way to Summon Dark Magician Girl the Dragon Knight? She’s considered to be a Dragon-Type Fusion Monster, so you could always fuse Dark Magician Girl from your Graveyard with a Dragon-Type monster using something like Dragon’s Mirror, but the best way to do it is to use The Eye of Timaeus, just like the Pharaoh did. The Eye of Timaeus allowed the Pharaoh to transform his “Dark Magician” monsters into whatever form would be most useful for the task at hand, and you can do the same if you add The Eye of Timaeus to your Deck. Any Fusion Monster that names a “Dark Magician” monster as a Material can be Fusion Summoned by targeting the appropriate monster with The Eye of Timaeus, so you could even Summon Dark Paladin with it if you’ve got the original Dark Magician on hand! And it’s not just an ability that works backwards with the current catalogue of Fusion Monsters – any future Fusion Monster that names a “Dark Magician” monster as a Fusion Material Monster would also work with The Eye of Timaeus! One of the easiest ways to Summon Dark Magician Girl is by using the Magician’s Circle Trap Card. You can activate it when a Spellcaster-Type monster attacks, and then both players Summon a Spellcaster with 2000 or less ATK from their Deck in Attack Position. While you might worry that you’re giving your opponent a monster as well, keep in mind that the only Spellcaster that you’re likely to see outside of a dedicated Spellcaster Deck is Effect Veiler – and that’s a card you want to see in Attack Position on your opponent’s side of the field! As for what Deck to use Magician’s Circle in, give it a shot with Gravekeepers. You do a lot of attacking with strong Spellcaster monsters to begin with, and adding more firepower to your side of the field, backed up by Imperial Tombs of Necrovalley, can be absolutely devastating. Follow that up with The Eye of Timaeus to Summon Dark Magician Girl the Dragon Knight, and you can cut off every line of defense your opponent can muster up. The fact that you can also refill your hand easily with Gravekeeper’s Stele is just icing on the cake! You can also use The Eye of Timaeus in combination with Elemental HERO Prisma. Without even needing to Summon Dark Magician Girl, you can send her to the Graveyard with Prisma and copy her name because she’s a singular specifically named Fusion Material Monster of Dark Magician Girl the Dragon Knight. In fact, you can pull the same trick with Dark Magician, giving you access to Dark Magic Attack and all of his specific Fusion Monsters. Dark Magician Girl the Dragon Knight and The Eye of Timaeus are just the first of many awesome previously-TV-only cards that are in Dragons of Legend. Stay tuned, because in the coming weeks we’ll be showing you a whole lot more!